Every home has a best doctor in itself, called the Kitchen. Unfortunately, a majority of households failed to recognize or realize the importance of having a healthy kitchen. Home cooked meals are not just delicious, but also healthy. Guess what, the culture of home cooking is diminishing to a great extent. You are hungry, drive around, go grab a meal and satiate your hunger! Moreover, just dial a number to deliver the food at your doorstep. Thankfully, many of us realized he importance of eating healthy to curb the roaring lifestyle diseases. Slowly and religiously people starts following Ayurvedic way of living, for which Ayurvedic cooking, rather Ayurvedic eating is the base. Ayurvedic cooking isn’t really possible without a comprehensive setup of Ayurvedic kitchen. Before we look into how to setup Ayurvedic kitchen, get an insight on why Ayurvedic Kitchen. Our lives transits and transform for better with Ayurveda. Ayurvedic principles of life talks generally talks about blending with nature to avoid the consequences. Lives of humans are surrounded by innumerable transitions, all the time. For instance, season change! Ayurveda teaches us to cope-up with, change and manage each and every transition with the ultimate aim of optimal health and well-being. The basis to manage all those transitions lies in or starts with eating. Thankfully, many of us realized the importance of eating healthy to curb the roaring lifestyle diseases. We are what we eat and Ayurvedic principles of cooking and eating strongly proves this! Setting up Ayurvedic kitchen isn’t about following an Ayurvedic diet for some time. Make it a part of your life, simply, you will have a sensation, ‘never felt better’ when you abide by Ayurvedic way of living through cooking. How to Setup Ayurvedic Kitchen? Setting up Ayurvedic kitchen is not a rocket science. All you have to do is to rely completely on nature to source your kitchen ingredients. Of course, you should add a bit of the authentic Ayurvedic principles. Ayurvedic cooking is totally a vegan based diet called Satvic diet, which has no rooms for non-vegetarian ingredients. Ayurveda is blended with nature! In fact, it was discovered from the nature itself. Imagine the source of some Ayurvedic herbs, Himalayas, the treasury mountain with massive amount of Ayurvedic herbs! So go for all the fresh and raw products. Also, make sure that the fresh products are cultivated organically without utilizing chemicals and fertilizers. Remember that the rich nutrients and goodness of a fresh fruit or vegetable is ruined by the chemicals / fertilizers used to ripen. So, using the organic and natural manure retains the nutritious value of products. The same is applicable for pulses and grains. It is definitely a welcoming idea to grow your own garden to load your Ayurvedic kitchen with fresh produce. Remember to use the seasonal produce grown during every season in your kitchen. For instance, cucumber, melons, mangoes, etc during summer season. Next comes the herbs and spices. Many believe spices are unhealthy, which is wrong. In fact, majority of fresh herbs are dried as spices. Ayurvedic way of eating gives more importance on flavor and taste. Each taste has its effect in the body, aids in curbing down the symptoms and even cures many diseases. For instance, cinnamon tea or foods flavored with cinnamon reduces the blood glucose levels, a natural remedy for diabetes. 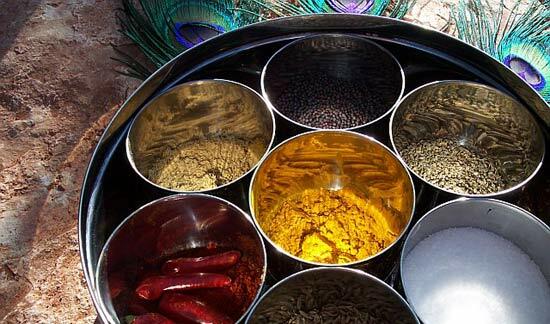 Generally, Ayurvedic meal includes eating the six different tastes at varying degrees for every major meal. It represents a balanced and healthy diet. Common kitchen herbs are Turmeric, Cinnamon, Zinger, figs, Garlic, Onion, Coriander, etc. Stock up fresh herbs, spices to add flavors to the food. Ayurvedic kitchen is not a bland, rather more delicious and spicy. Remember to use the spices and herbs to season the cooking moderately according to each season, as every season, called Ritucharya. Ayurvedic Kitchen isn’t about the ingredients used to cook food. Rather, using the utensils to cook the food. Vessels play a major role in incorporating the benefits of Ayurvedic cooking. Iron pots, tawas – Anemia is one of the new age diseases, nothing but the deficiency of iron. Cook in iron pot, iron tawa and vessels to get an additional dose of iron naturally. Mud Utensils – Used for several centuries in many south Asian countries, Mud pot cooking provides the most delicious meal of all. Also, it neutralize the pH balance in the body, reducing the risk of many diseases. Copper – Cooking in copper vessels is not recommended as it sometimes accompanies a few digestive and toxic issues. Yet, strong water in the copper container is very healthy. It reduces the ageing process, kills infectious microorganisms, cures iron deficiency, improves the skin health and promotes digestion process. Get the wooden chopping board to chop vegetables and fruits. You can also use glass bowls. Eat in silver plates or banana leaf to get additional minerals. Ayurvedic kitchen should never include utensils made of these materials. A healthy and energetic life has its base from the kitchen. Kick start your healthy lifestyle by setting up the Ayurvedic kitchen. My organization is in interested in setting up ayurveda therapy clinic [India Method of body therapy – Pancharkama] in Nigeria. Can you please update me with proper information and requirements in terms of facility needed from India and locally.